I just bought a Big Foot travel trailer which has the little lights just below the roof line, red and yellow on the corners. I believe they are called marker lights. Are these required by law? Can I take them off and fill the holes in with fiberglass? These just seem to be yet another way for water to enter the trailer. I really just don't like having these lights if they are not really needed. 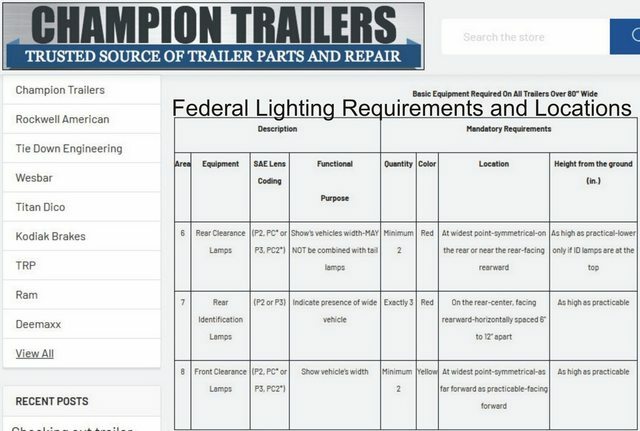 If your RV is 80 inches wide (which the vast majority of RVs are) or wider, the lights are required by federal regulations. And to be legal, they must also be operational. Congratulations on your Bigfoot. I owned an older one, and the marker lights never leaked. If the appearance bothers you, there are places on line that sell attractive ones with chrome bezels. You can then fill the wire holes with a sealer underneath the light gasket. The lights are required, that's why they are there. This chart should answer your question. Thanks to all who have responded. Ken, I downloaded the pdf on Fed regs. Old-Biscuit I went to the trailer site. Geez Louise, I had no idea this would be so complicated. Bob, the marker lights do have butyl tape behind them. Some of it came out when I unscrewed a light thinking I could dry out the condensation behind the lens. Unfortunately I then learned that once a screw comes out of molded fiberglass it does not screw back in as firmly as it was originally. So I put on additional sealant. The fixture itself is very solid. Cecil I found those chrome bezels. I expect to order one and see what it looks like and if it adds anything to the fixture: Very interesting, I have not seen these bezels on any trailer to date. Well if you want to get persnickety about it, the 3 centered on each end are the "identification" lights, and the ones at the corners, (front, rear, and both sides) and the ones center of each side are markers. Sometime late '40s/early'50s, when the speed potential between cars and truck was getting pretty great it was decided that lights mounted high, and spaced a set distance apart, would help a experienced driver id the vehicle as heavy and tell how far away it is. They are also considered a SAFETY feature. If your ever stuck on the road at night you will want all the lights you can get. A dark vehicle parked on the road = dark consequences. Do not follow me for I may not lead.Do not lead for I may not follow.Do not stay beside me for the path is narrow.... In fact just leave me alone! Bill, I am not sure what replacement lights you are referring to when you refer. to "more robust" marker lights. The OEM ID and marker lights used on my Big Foot appear to be (Amazon) Diamond Group 52438 Valterra Products Inc DG52438VP Marker Lamp Led Red (and yellow) 2-Wire. These are LED and seem robust to me. I have a lot to do to get ready for this years camping season so I don't expect to address the light issue until probably late fall after we get back. I may have to craft a bezel somehow to correct the way the lights are attached to the trailer. I am very much interested in upgrading these lights but have no idea what an upgraded light is: if you please, would you identify what lights you are referring to? Thanks for differentiating between regarding ID and marker lights, I did not know this. As far as an "upgrade", I like this brand, LED and sealed. Find your hole spacing and light size, then choose the one you like best, of course, keep the color the same for each light location. I have a fiberglass header on my trailer, I replaced all the light fasteners with stainless hardware, and used a larger flatwasher and locknut for the backside of the fiberglass, just snugged a bit, along with the butyl tape already mentioned. Soldered the wire connections and used heat shrink while I was at it. You may not be able to easily access the backside on your trailer. Although my current fifth is a higher end brand, the marker lights were cheap. All the amber ones were burnt out. I had unusual hole spacing so Amazon was no help. I found superbrightleds.com to have a large selection, and many with my hole spacing. I bought some attractive ones with the bezel attached. They were an easy install, and really dressed up the exterior of the trailer. The marker/id lights on my old RV were in sorry shape when I bought it. In fact, the one on the side of the left front (waist high) was missing - just a wire hanging in the air. When I took it out on the road the first time I found that the drivers along side could not see my front turn signal when I wanted to change lanes. I found a source of "dual mode" marker lights that also functioned as turn signals and replaced the lower left front, left rear, right front and right rear with them. No more problems changing lanes! There are also markers on the lower center on both sides. Once I run the turn signal wiring to them I will also change out the lower center markers.